NIA CHARLESTOWN NEVIS (September 23, 2014) –Junior Minister responsible for Sports on Nevis Hon. Hazel Brandy-Williams, paid tribute to two Anguillan drag racing enthusiasts who had tragically passed away one year ago. 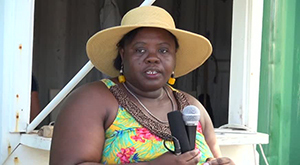 She was at the time delivering brief remarks at the 31st Independence Anniversary drag racing meet at the St. James Raceway, Butlers Village on September 21, 2014. The Minister asked the spectators to observe a minute’s silence in memory of the late Marlon Harrigan and Esterline Silwood Connor. 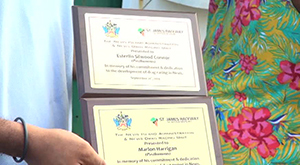 She also unveiled plaques for their contribution to the development of drag racing on Nevis on behalf of the NIA’s Drag Racing Unit. “I would like to distribute these plaques in [their honour]. The plaque [says]: ‘The Nevis Island Administration Drag Racing Unit presents to Marlon Harrigan in memory of his commitment and dedication to the development of drag racing in Nevis.’ We do not have any of the Anguillan counterparts here today [but] we will just hold them [and] get them over to Anguilla as soon as possible,” she said. Meantime, Minister Brandy-Williams assured the drag racers of the NIA’s support for Drag Racing on the island and used the occasion to recommit its support. “My presence here this afternoon is to recommit ourselves to the sport of drag racing. We are all aware that we would have gone through a transition phase in the past couple of weeks and so, the word went out that we are not sure what is happening to drag racing in Nevis but I am here today to say to you that we are committed. “As the minister responsible for sports as well as the Nevis Island Administration, we are committed to the drag race fraternity. I met with the drag racers on Nevis two weeks ago and with the racers on St. Kitts a week ago. A number of issues were highlighted. I know there is some need for some remedial work to be done on the tracks as well [but] rest assured that those concerns have not fallen on deaf ears and so, as an Administration, I am saying that we are committed in terms of preparing the track better to see how much remedial work we can do,” she said. The Nevis Sports Minister noted that the vast land space at the raceway would necessitate a large amount of money to deal with all the concerns. “To bring it up to the standards that you would want to see, would take some tremendous amount of sacrifice and financial support and so, starting later this year or early next year, we will do some remedial work over time. So rest assured that we are indeed committed to the sport and we have taken on your recommendations,” she said. In conclusion, Mrs. Brandy-Williams asked the drag racers to adhere to the safety guidelines of the sport for their own protection. “I would like to say to the drag racers that the sport is a highly risky sport and so I would like you, at all times, to adhere to the strict security measures. I would have listened, as well, in terms of the outline of how the races are to be run and I am hoping that all persons would adhere to that as well…I think there is one more activity for the year and…I would like for you to continue to be a part of the drag racing fraternity in Nevis,” she said.